I am so excited to introduce my original "DIY disposable pan" idea! They are such a simple and inexpensive way to make pans in different shapes and sizes for just about any dessert, using things like foil, parchment paper and things you might already have in your kitchen, like ramekins and tuna cans! 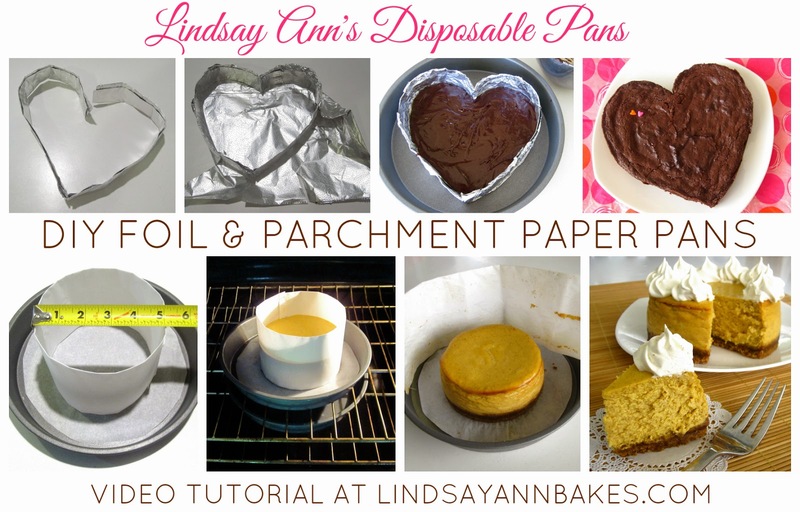 My DIY disposable pans are great for anything from brownies, giant cookies, layer cakes, bread and even cheesecakes! I've made small round pans, perfect for my small batch dessert recipes, made in a parchment paper pan. 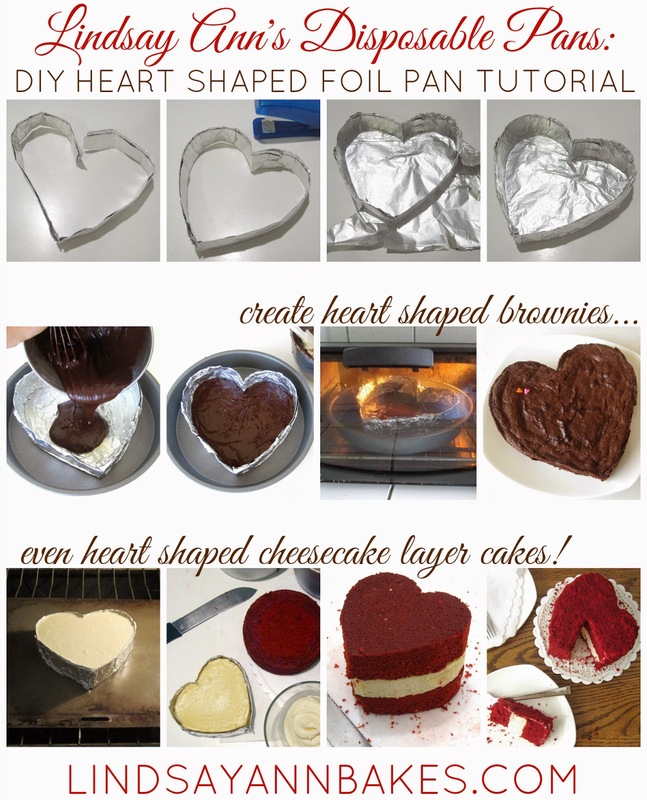 Or stick with the original heart shaped brownie! Or make geometric shapes, like I did with my cookie brownie. Cut a piece of parchment paper from the roll, (about 18 inches long for a 5 inch pan, shorter for smaller pans, larger for bigger pans). Fold it in half, lengthwise. This will help strengthen the sides of your parchment pan. Fold it in half again, lengthwise, creating a strip about 4 inches tall. Wrap your parchment strip around an item that is the size you would like your pan to be. In this case I wanted a 5 inch pan, which happened to be the same size as the oatmeal container I had. Cans of corn, beans, soup, etc. also work, to create mini 3-4 inch parchment pans. Or you can just eyeball it and use a ruler to create a ring in your desired size. Staple the sides together, making sure there is a row of at least 3 staples where the parchment is connected (a staple on top, bottom, and in the middle). 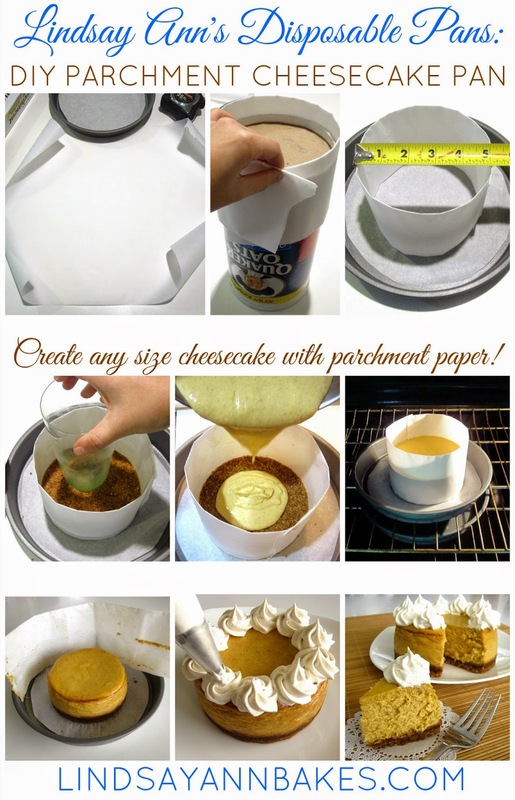 Line the bottom of a cake pan or cookie sheet with parchment paper, and place your parchment ring on top, in the center. Press in crust, fill and bake. Then Peel away parchment ring (being careful of staples) and serve! And if you don't want to make your own pans, get creative and use things you have around the house! I use things like bread loaf pans and oversized tuna cans (wash them out well and make sure they are oven safe! 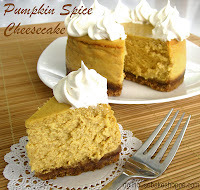 ), to make tiny sheet cakes and layer cakes!